President Obama and First Lady Michelle Obama took part in a Hanukkah celebration in the East Room of the White House last night, the second night of the Jewish festival of lights. 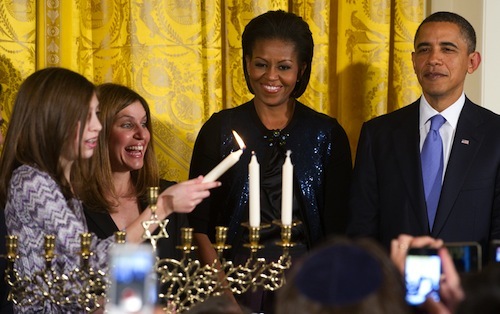 The Obamas watched as guests recited prayers and lit the candles of a menorah. The guest list of over five hundred people also included one-third of the Supreme Court. Justices Breyer, Ginsburg and Kagan were all present at this event. A unique menorah, loaned to the White House by a New Orleans’ congregation, was used for this ceremony. The beautiful menorah was one of a few items to endure Hurricane Katrina; it was restored to be re-lit for Hanukkah. For this celebration, Mrs. Obama was dressed in a L’Wren Scott cashmere cardigan adorned in blue sequins (available here). She paired this cardigan with a black dress, featuring a full skirt and accessorized by adding a vintage brooch pinned at her shoulder and small, stud earrings. To get a better look at the dress and hear President Obama’s address, check out the video below! Take a look at the video below for a preview of the “Simple Gifts” decorations. For this event, Michelle chose to wear a sleeveless, navy and gold sheath dress paired with a matching jacket. 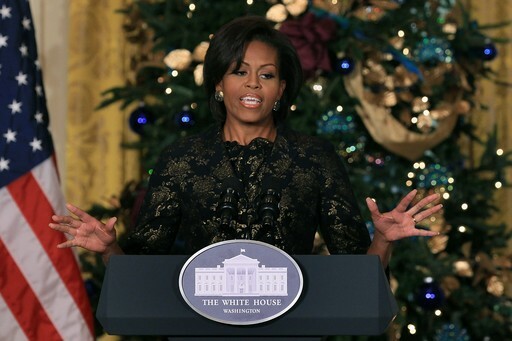 In my opinion, this year’s Christmas theme is very original, especially compared to many of the first ladies’ often repeated themes, such as “Children” or “The Nutcracker.” Additionally, I think Mrs. Obama’s attire looks lovely! She is starting the holidays off with a bang! 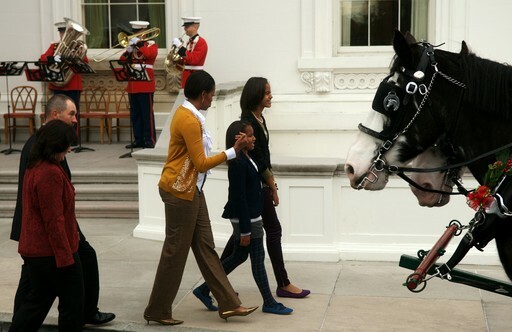 What do you think about the 2010 White House Christmas theme? Thanksgiving is over, and the Christmas season is quickly approaching. 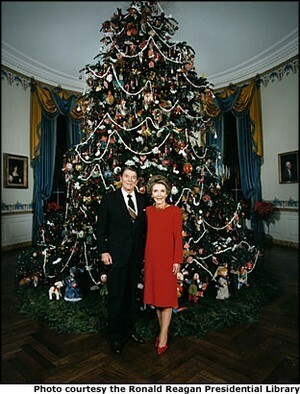 Whose tree farm will Mrs. Obama select to supply the White House with the official Christmas tree of the season? 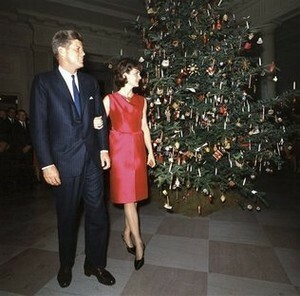 In honor of this event, let’s take a look at the great style of the woman who first began the tradition of the White House Christmas tree. The first indoor White House Christmas tree was the tree of President Benjamin Harrison and First Lady Caroline Harrison in 1889. 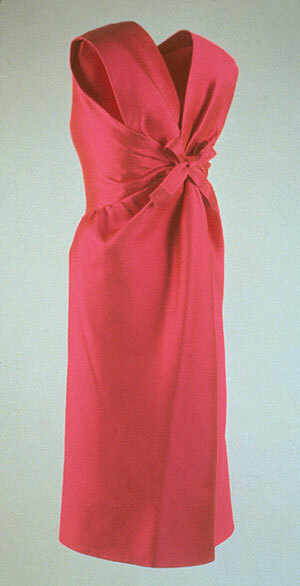 It stood in the Oval Room, located in the upstairs of the White House. Caroline, an artist, helped decorate this first White House tree, branched adorned with lit candles. Little did Mrs. Harrison know, she was setting the stage for a much-loved holiday tradition, the White House Christmas tree. 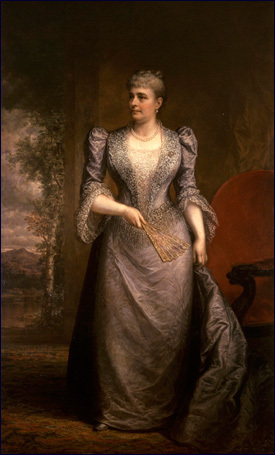 Following Caroline, not all first ladies chose indoor trees; however, Lou Henry Hoover’s tree began the yet unbroken custom of an indoor tree, known as the “official” White House Christmas tree. Since that time of 1929, the honor of trimming the White House Christmas tree has belonged to our nation’s hostess, the first lady.